Here is a pancake tortoise looking for a place to hide. I like pancakes and I like tortoises, so I was very excited when I heard about the pancake tortoise. This small tortoise grows up to 17 cm long and get their name from their very flat shell which is much lighter and is made up of several pieces, rather than one solid shell that other tortoises have. Their shells don’t give them much protection against predators, but they are much faster than other tortoises and are flat enough to hide under rocks and in small crevices. Pancake tortoises are excellent climbers with long, sharp claws and flexible legs that enable them to climb up almost vertical rock surfaces. 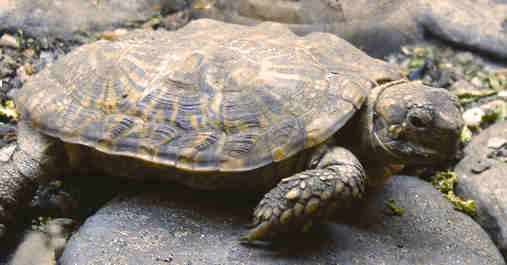 Unusually for tortoises, females only lay one egg at a time, although they can lay another one a few weeks later. They live in small groups in Tanzania and Kenya and are vulnerable to extinction due to habitat loss and poaching for the pet trade. Are there any other interesting facts that you would like to share about pancake tortoises?